This intervention from its outset searches a dialogue between Simondon and Latour, a fictional dialogue, that nevertheless exists though it hasn’t happened. It hasn’t happened, or should I say it was once about to happen, when Latour praised Simondon’s Du Mode d’existence des objets techniques, and commented that it is a work that didn’t yet find its successor. But it does exist, this fictional dialogue, or at least we can talk about its mode of existence if you prefer since being fictional is also a mode of existence. We cannot draw a squared circle but we can think of a squared circle, it has meanings, this was an example given by Edmund Husserl as a critique of formal logic. The secrete philosopher of Bruno Latour, Étienne Souriau hold a similar idea in his Les différents Modes d’existence. A fictional object or character doesn’t occur in time and space as a physical object, or a historical event, but it does exists in works, in the socio-psychological life and imaginations of their readers and witness. Modes of existence is always plural, it doesn’t follow the rule of contradiction, it is rather key to what Latour calls ontological pluralism. The question of the mode of existence departs from the question of Dasein posted by Martin Heidegger, and the meaning of Sein, eliminates the Ontologische Differenz between Sein and Seienden in order to de-prioritize certain mode of existence, with a kind of ontological politeness. Modes of existence is a new organon to the analysis of modern life, and also one that revolt against the 20th century philosophy aiming a unified theory of existence. Now to enter the modes of existence, according to Latour one must employ a new dispostif called diplomatic, meaning one should be aware of oneself, resisting esoteric temptations, while being polite and try to negotiate different terms. Hence Latour proposed to go back to an anthropology that starts with reflection on European modernity instead of starting with dialogues with others. It is also this word “Mode of existence” on the one hand brings together Latour and Simondon to us since Simondon is a philosopher of the mode of existence instead of existence; on the other hand, it allows us to go beyond the question of network in actor-network theory, as Latour himself said in an interview with la vie des idées “what is complicated to understand, maybe, for those who know the rest of my works, it is that network is no longer the principle mode of driving, of vehicle. The world became a bit populated: there is more vehicles moving in different forms”1.That is to say, network is only one mode of existence out of 15 different modes, among which we also find Reproduction, Metamorphose, Habit, Technics, Fiction, Reference, Politics, Right, Religion, Attachment, Organization, Morality, Preposition and Double Click. Network can no longer alone monopolize the academic social research (by saying so, network still seems to be the framework of the whole book2). Instead it is necessary to re-articulate this specific mode of existence with other modes of existence. For Latour, new position or preposition on the mode of existence allows us to open up the new field of philosophical investigation of the Moderns. 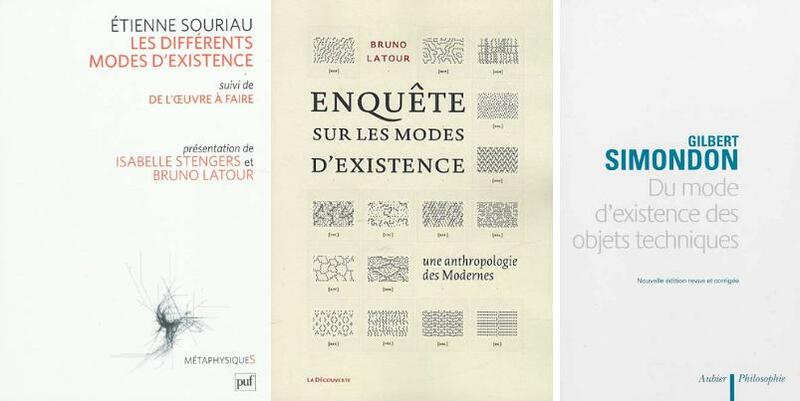 The task is no longer how “we have never been modern”, a project done 20 years ago, but rather according to Latour it is an effort to complete the uniquely negative title – we have never been modern – “with a positive version this time of the same affirmation”3. But then he continues abruptly: “yet Simondon remains a classical thinker, obsessed as he is by original unity and future unity, deducing his modes from each other in a manner somewhat reminiscent of Hegel…Multirealism turns out to be nothing more, in the end, than a long detour that brings him back to a philosophy of being, the seventh of the modes he sketched.” Latour copied and pasted these paragraphs in numerous articles, this commentary on Simondon is only a passage to the work of Étienne Souriau’s Les Différents modes d’existence. For Latour, it was Souriau but not Simondon who really showed us how can one affirm an ontological pluralism without falling back to the old and weak anthropological relativism and philosophical monism. In this passing [passe] in Latour’s own sense, Simondon was portrait as an original thinker who wasn’t able to break away from “classical philosophy”, then unfortunately fell back to the shadow of the “original unity and future unity”. But what does it really mean by this quote from Simondon? What does it mean by “this de-phasing of the mediation between figural characters and background characters translates the appearance of a distance between man and the world” and what would be the context of such a quote? If we allow ourselves a bit of patience, Simondon was referring to the figure and background distinction as explained in Gestalt psychology. The figural reality expresses the possibilities of human action in the world, and the background reality expresses the power of nature. Simondon was trying to explain the relation between technics and religions, that originated from the incomparability between man and the world. A society of magic, sees Simondon as the moment where subject and object, human world and nature, figure and background were not fully distinct. But it is also the result of the resolution of incomparability between human being and its milieu, the unity described by Latour is only the possibility for incompatibility. If it could be counted as the repetition of the gesture of classical philosophy in searching of an unity, then biology, physics and chemistry may also have to bear the same accusation. What is indeed profound in Simondon’s concept of the mode of existence is that this tension or incompatibility has to be resolved constantly both in the process of individualization of technical objects, and also individuation of living beings. It is also by the notion of incompatibility that one has to affirm the multiplicity of objects and their modes of existence. Indeed, Simondon doesn’t think that one can seize an object by its end, there exists ‘espèce technique’, it is rather more productively to think of analogies between different technical species, for example a pendulum clock and a cable winch5.We must recognize here that Simondon’s didn’t only talk about the mode of existence of technical objects, for Simondon, the theory of ontogenesis and individuation is also an inquiry into how different modes of existence interact with each other and and in constant process of evolution. In other words, there is no peace for us, and there hasn’t been a mode of existence called peace – the goal of some kind of all diplomatic activities. Any pursuit of stability is only an illusion, though lets say such an illusion is also a mode of existence. There is no unity of identity, or recollection, of unity composed of parts and united according to certain method of classification6. For Latour, or his reading of Souriau, the ontological pluralism/multi-realism must affirm the existence of phenomenon, things, soul, fictional beings, god, without recurring to a phenomenological account. It must revolt against the Kantian tradition and move towards a speculative realism without correlationism. Some commentators on Simondon such as Xavier Guchet sees the similarity of the approaches between Simondon and Souriau, especially the common word “modulation” they used to signify the internal transformation in being, which is exactly dephasing in Simondon’s own vocabularies, and quoted by Latour above. As Guchet states for Simondon “unity of existence is not an unity of identity, of recollection from an situation of scattering[éparpillement], an unity obtained by composition of part and according to a method of classification”7. If there is an unity in the thoughts of Simondon, then this unity is nothing other than tension and incompatibility. Simondon didn’t use often the word “realism”, but rather “reality”, and what is human reality is actually always in tension with technical reality, while what signified by technical reality is not a single unity or a single phenomenon, but a reality conditioned by many other factors, such as geographical, industrial, natural, etc. For example, the production of white boots and raincoats is conditioned by limitation of the research in material, the visibility of certain colour in that environment, etc. If we can translate into Latour’s own vocabularies, it is the heterogeneous actors in play with different values. Latour didn’t elaborate all these, except an abrupt assertion that seems a bit brutal, and lack of ontological politeness – to certain extent. In the book Enquête sur les Modes d’existence, we can find another commentary from Latour on Simondon. The section collected in the book is from his earlier article Prendre le Pli des techniques, in which Latour praised Simondon, but at the same time, proposed to look at the mode of existence of technics instead of the mode of existence of technical objects. Latour and Simondon are just like two acquaintances, you smile and say hi without shaking hand, but he has to node his head anyway since there must be a politeness if one wants to be diplomatic. 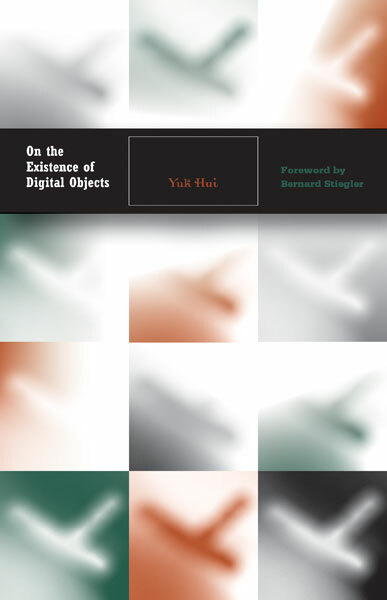 Latour thinks that it is impossible to find the technical mode of existence in objects themselves but rather technics itself. Since technical objects don’t give us visibility, in fact they make technics opaque to us. One can probably find a similar concern from Heidegger, especially the question of Besorgen. We are concernful beings and we always forget what is in front of us, what we are using, especially Being which we are and in which we dwell: we are far away from what is closest to us. But this dialectic movement of visible and invisible seems to be a general tendency of all technical objects, and it is the particular mode of existence of technical objects and technics, which has been widely recognized in the study of technologies. Latour was right that technics hides itself deeper than alétheia. The mode of existence of technics is only visible through technical objects, and it is also rendered invisible by technical objects, since on the one hand there is no technics without materialisation, or leaving traces; on the other hand materialisation doesn’t assure visibility, that is to say one cannot find identity or essence from eidos. 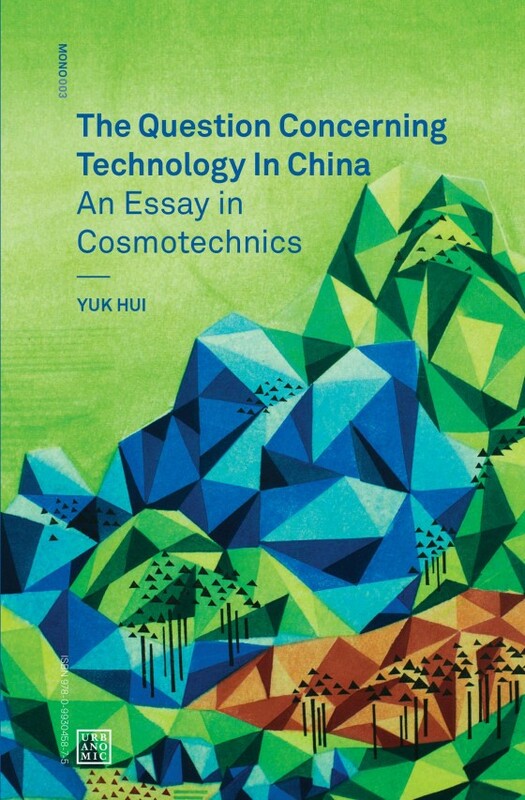 I would rather say compared to Latour’s proposal of going back to the “transcendence” of technics, Simondon shows a more concrete account of the levels of existence of technical objects: namely usage, historical characters, and the profound structure of technicity. And these modes of existences also account different level of visibility and invisibility. For example, how can we think of the diode in your computer? Or lets take away the subject who speculates, how does the diode in your computer exist by itself, a diode that really exists in a black box even if you open the case of your computer and check every component? How can we think of Mercedes Benz, the different models that nevertheless associate with the brand name Mercedes Benz? When are are visible to us and invisible to us, without being reduced to question of transcendence and immanence? As Alberto Toscano describes Simondon’s position, ‘whilst [preindividual being] is yet to be in- dividuated, [it] can already be regarded as affected by relationality. This preindividual relationality, which takes place between heterogeneous dimensions, forces or energetic tendencies, is nevertheless also a sort of non- relation […]. Being is thus said to be more-than-one to the extent that all of its potentials cannot be actualized at once’. Simondon like DeLanda wants the world to be both heterogeneous and not yet parcelled out into individuals. In this way, specific realities lead a sort of halfhearted existence somewhere between one and many9. Harman further explained that this is certainly not the case for Latour, since “his actors are fully in- dividual from the start; his philosophy contains no such concept as ‘pre- individual’. His actors are not blended together in a ‘continuous yet heterogeneous’ whole, but are basically cut off from one another. There is no continuum for Latour despite his relationism, and this thankfully entails that his relationism is less radical than it is for philosophies of the virtual (note that Latour’s rare flirtations with monism seem to coincide with his equally rare flirtations with the term ‘virtual’).” In fact, maybe it is because Harman didn’t read Simondon since he relied on Alberto Toscano’s reading, he hence has a rather vague idea of individuation. Here we see another problem of not being diplomatic enough, that is due the disagreement of word without looking into the content. The question for us is how can we negotiate different ontologies, not to generate an unity, but to affirm different realisms without a double click? In other words, how to become a professional diplomate as Latour suggests? The fact that there are always individuals for Simondon, but individuals didn’t disclose us anything of operation or process, which can only be studied through individuation. Taking individual as isolable individual or as part of collective, according to Simondon is the problem of the substantialism of sociology and psychology. For Simondon, as well as Latour, individuals cannot be reduced; but for Simondon, who sees further than Harman, the individual cannot be reduced to itself. Each individual is not individual in itself, but always accompanied by the pre-individual, which is the potential and energetic that provide the motivation for individuation: it is a transindividual rather than an individual. And if actor-network aims to look into the complexity and the process of social phenomenon, didn’t Simondon and Latour walk in parallel? Now if Actor-Network theory has to be re-articulated according to the modes of existence of the modern according to Latour, we must pay attention to the translation that is not necessarily diplomatic but sincere. 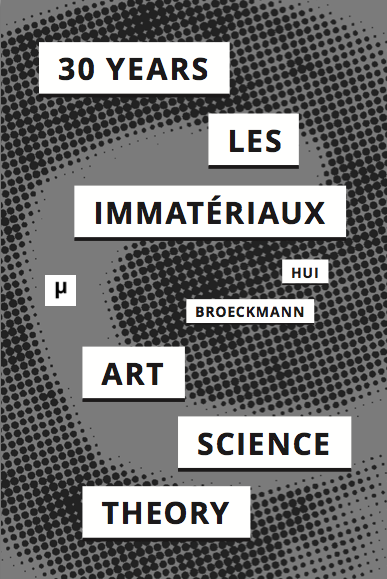 We must also note that this notion of translation is so important in Actor-Network theory, since according to the annotation of Latour’s Ebook, it is called la sociologie de la traduction, sociology of translation. But lets be a bit careful here, with the word traduction, Latour distinguish it from translation. For him, the particular mode of existence he calls “Double Click” is a translation without traduction, meaning without transformation, without process, it is simply a jump from one process to another. But isn’t Latour and Harmon’s reading of Simondon also such a double click? I am not rejecting Latour and Harman due to their double clicks on a button called “Simondon”, since we have to be diplomatic and polite. But maybe we need to pay attention that, there are different style of being diplomatic, and I feel like a more productive dialogue is possible if we are able to negotiate like diplomates who try to translation different terms and requests into conditions and agreements, as Latour himself suggests. These negotiations may allow us to peek into a more profound investigation on the modes of existence of Moderns. Actor-Network, a concept according to Latour needs to be renewed in the inquiry into the mode of existence, the remaining task is to re-situate network in the broader framework of the modes of existence. Lets start and conclude with something lighter and more motivated and leave something heavier and more specific behind, so that we can find ways to start a real negotiation – even though you may criticise this is also a double-click of some kind later. Instead of going into every mode of existence, lets me outline a framework for such a dialogue. These are four pairs of beings: 1) Actor – Individual; 2) Network – Milieu; 3)Relations – Affectivo-emotive/Social-psychological; 4) Traduction – Transduction. We wouldn’t be able to go through all these pairs in details, since they deserve a work of its own. Here I can only offer a very brief detour, shows how Latour and Simondon’s interest in describing processes and operations can give us a synthetic reading of both. We will see that how different modes of existences can hardly be classified into 15 categories and simple overlap between these categories could already bring us a lot of headaches. What seems to me problematic is that actors as individuals – according to Harman – are too rigid. Of course, each individual exist, me, I am speaking in front of you as an individual, but I am not an individual to you as a total other, since you are listening to me, and we are thinking together, at least you are thinking according to my voice. You are listening to my demands, my ontologies, with your politeness. And I am observing you, some of you smiling, some of you shaking head, many of you checking Facebook, and I must adjust my speech, my tone, the volume of my voice, my perception of my speech and even myself. There are many possibilities that is totally outside me, but they are the pre-individual for me as a transindividual as Simondon proposed. Simondon is more persistent with trans-.Note that it is a transindividual but not an individual; a transduction and not only a traduction, transduction is at the same time change and exchange that triggers transformation of structure. Latour, he himself wants to dissolve network into the question of the mode of existence, and here we can see again the possibility of reconstitute it in the concept of milieu. The network of Latour is too much into “international relations” due to its diplomatic nature, and for Simondon the milieu has to be socio-psychological and emo-affective, it is also why Simondon was able to talk about an social-psychology of technicity. This is not a simple defence for Simondon, since it wouldn’t be fruitful to do so, but in order to search the possibility of a dialogue that doesn’t dismiss each other in a double-click. For an inquiry into the modes of existence is possible, it seems that one must not repeat what has happened in the history of the inquiry into existence, like how Jorge Luis Borges made fun of Bishop John Wilkins’ ontology and the funny Chinese encyclopedia; indeed 12+310 categories doesn’t seem to be much different from15 categories except when the “+” counts. If we dare to take it a step further, then it is how a metaphysics departs from its history, not only in terms of content, but also style.